There is little more exciting than the release of a Google algorithm update. This dramatic story commonly begins with chatter among SEO professionals over ranking fluctuations, a message announcement from Google, a collective freak-out from the search community, followed by deep data dives and a communal conversation on why Google has again seemed to shake up the search landscape. Nonetheless, it allows us to reflect years later and review why the algorithmic update happened. Did we see it coming? How did it change SEO? And did it lay the groundwork for future algorithmic updates? What Was the Google Vince Update? Some might debate the official algorithmic change type but a “simple change” that causes a wave this big across the SEO community should be considered a true Google update. Simply put, the Vince update was a quick, noticeable change in broad-level, competitive keyword terms to favor first page rankings for big brand domains vs. previously ranking sites. 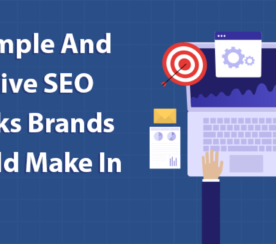 These were commonly less authoritative sites, affiliate sites and those that had won this coveted visibility purely through pouring on SEO efforts, on-page and off-page that would deem them, even in the least, as authoritative. To this day, it begs the question or questions of: Did Google owe big brands? Was this simply more credit given to “trust” and “quality” or simply a smack at the first-page dominance of affiliate marketers who had gamed their way to visibility nirvana? Often, before a large-scale algorithmic change is to roll out in entirety, we see subtle cues or hints dropped from the mouth of Google. In the case of Vince, we weren’t technically warned. But maybe we should have paid a little closer attention to the words of Eric Schmidt, who was CEO of Google at the time. 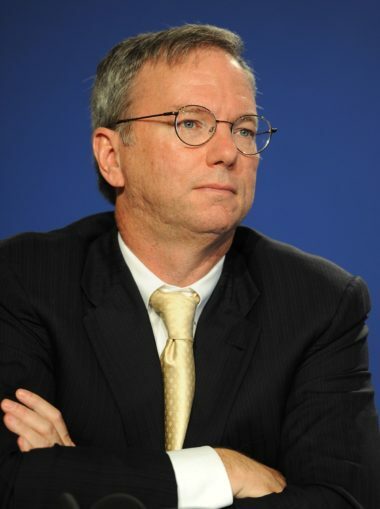 As reported by Ad Age’s executive editor, Nat Ives, in October 2008 regarding Schmidt’s comments at a Google-hosted industry conference, it isn’t hard to see Schmidt and possibly Google’s intentions for the future. This is quite honestly one of the few times that Google didn’t beat around the bush and actually told the world how they really felt – and what they were potentially going to do. Fast forward three months to late January 2009. Big brands suddenly began quickly appearing for broad-level, high volume keyword searches. Keep in mind that the SERPs have always been in flux (e.g., the introduction of Universal Results in 2007, etc.). But it was easy to see that there had been some big swaps in the search results. Chatter on noticed change began to appear on February 20 within the threads of the WebmasterWorld, queued up by a user named Voasi who makes mention of a shake-up for searches including [car audio], [laptop] and [quit smoking]. The ripple then grew into a wave as Barry Schwartz of Search Engine Roundtable noticed the thread and brought it to the forefront. The growing wave went tidal when Aaron Wall of SEObook published a great analytical post. Praised by many at the time, he broke down the Vince Update and provided insight into specific verticals seeing shifts. As the SEO world stirred, Cutts starred in a March 4 Google Webmasters video, Is Google putting more weight on brands in rankings? Here, Cutts eludes that this isn’t simply a favor paid to big brands, but more a shift in catering to those sites that possess authority, trust, and relevance. The SERPs had undoubtedly changed drastically for coveted broad-level terms. As highlighted in Wall’s post, brands took charge on search queries long dominated by affiliate marketers such as [online degree], [health insurance], and [auto insurance], but also on retail searches, such as [boots], [watches], and [diets]. Webmasters posted similar findings, bringing the SEO community to an uproar. They raised their “no-fair” flags with fears of how they wouldn’t be able to compete against those who had deep pockets to utilize SEO resources to further concrete their placement on the first page. Did Google owe big brands and pay upon them? No, not really. Looking back at the progress of the Google algorithm over time, the Vince update seemed like a cog in the wheel of their core structure to value quality, trust, and relevance. The early 2000s were a heyday for affiliate marketers, spammers/black-hatters and those gaming search engines for coveted placements. This update rollout helped Google to fight what no spammer or affiliate could be, a brand. A brand is more than a website. A brand naturally achieves a clean inbound link profile as it relates to linking site relevance and anchor text association. Brands are mentioned broadly in news and media by their name across high authority outlets. Brands receive a wealth of branded searches, followed by high click-through rates and low bounce rates. 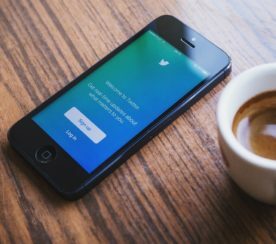 The culmination of an online brand through social, news and all things web are what help to provide the trust signals needed for a relevant first-page ranking. While many were quick to voice their opinion either with deep conspiratorial ideas to simply feeling that there were now algorithmic ranking factors such as if a domain was tied to a publicly traded symbol or if more weight was now placed on domain age. Given time, a jaded SEO will come up with some of the greatest causes for algorithmic shifts given or feelings of being pushed into the corner. Ultimately, I personally don’t feel this was a secret handshake to big brands. Heck, consider that holding them back only means that they reach further into those deep pockets to feed AdWords. 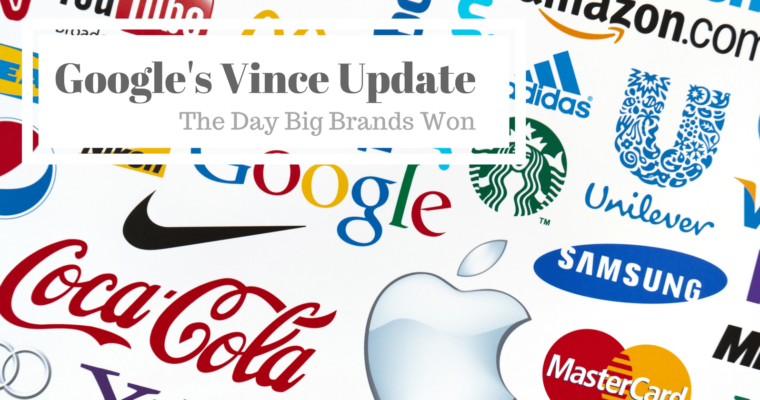 The Vince Update appeared to fall in line aside other updates in the Google’s evolution to supreme relevance. Consider that early century updates such as Florida (2003) helping to improve on-page spammers and Jagger (2005) where slight precursors to Vince as quality signals were being established. Post-Vince we can see that it laid the groundwork for quality and relevance signal fueled updates such as Panda (2011) and Penguin (2012) where Google who had almost defeated affiliates could now taper non-brand and resource sites through filtering high ad-to-text ratio landing pages and sites with thin content. You can even see the progression through to Hummingbird (2013) as it relates to semantic relevance in that a broad-level keyword search is probably best served by a brand. Longer-tail terms are likely meant for resource sites, comparison and review sites. It was easy for many of us to curse Vince initially because we thought Google was placing their foot on the collective throats of the little webmasters. Meanwhile, we imagined big brand SEO professionals leaning back another notch in their easy chairs. But maybe it was deserved. These “brands” were built over time and they were relevant. Their link profiles were typically clean, (*cough* JCPenney) and they had natural mentions across the web including social media, which Google announced mattered in 2010. Vince forced us to begin thinking outside a website we try to mold into a ranking machine, further into “all things web” where we create online experiences through social media, news, and resourceful content that is appreciated by users. Therefore, it isn’t how you SEO a website, but how you present a digital experience!